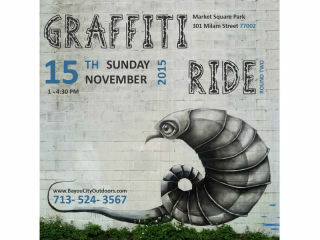 Bayou City Outdoors presents Graffiti Art & Bike Ride. Have you noticed the outdoor artwork adorning the city these days? Graffiti has moved from outlaw to street art, and some of the top artists and newcomers are painting it up, right here in Houston. This ride will go around H-town checking out some of the more prominent and promising graphics to be seen. Most of the ride is on the streets of Houston, so don't forget your helmet. The ride will finish at Niko Niko’s patio. No bike? No worries! You can pick up a bike from the B-Cycle kiosk around town.